The third in the Mickey Bolitar series, FOUND is an edge-of-your-seat, adrenaline-fueled story of love and loss. It’s fast, smart and emotionally engaging. This is Harlan Coben at his best. Coben’s seamless transition from crime fiction to YA should come as no surprise. Renowned for his taut, compelling stories, sprinkled with humor and a lot of heart, he’s perfectly suited to the genre. As a long-time Myron Bolitar fan, it’s been interesting seeing the continuation of the character through the eyes of his nephew, Mickey. Indeed, that’s what stirred me to read the series in the first place; but it’s not what’s kept me around. Mickey’s a brilliant character in his own right, with a troubled past, and the same do-gooder streak that made Myron so appealing. Witnessing this young man play the role of high-school detective (nobody calls him that, naturally) has been a fantastic ride, through the highs and the lows, and the heart-breaking consequences of trying to do the right thing. FOUND ties together many of the threads left hanging from the previous novels – including a stunning climax – but there’s still plenty for Coben to latch onto for future installments. 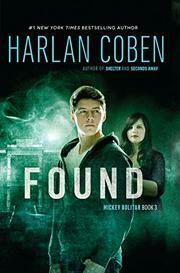 There are multiple plotlines in FOUND, which alternate precedence: there’s the high-school basketball drug scandal that’s rocked the team Mickey’s only just joined; his father’s supposed death eight months ago, which seems increasingly unlikely; the disappearance of Emma’s (Mickey’s best friend) online boyfriend; and continued shadow cast over Mickey’s crew by the Abeona Shelter, which is tied into various conspiracies. While there’s plenty for new readers to enjoy here, those who’ve journeyed with this cast from the beginning will truly enjoy some of the novel’s smaller, nuanced moments. I have been on a real YA kick recently – over the past month I’ve ticked off ‘The Maze Runner,’ ‘The 100,’ and ‘The Hunger Games;’ FOUND is a refreshing, grounded change of pace. I’m not as well-versed in the land of YA as I want to be – indeed, as I am aspiring to be – but I know a good book when I’ve read one. FOUND is certainly that; a great entry in a series with plenty of fuel left in its tank.